Application developers know a basic truth: people are obsessed with the weather. The slew of weather widgets and apps for both the Mac and iPhone are testament to this fact. 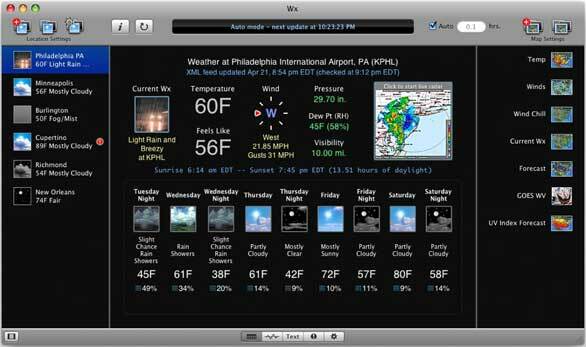 Wx is another entrant into the crowded meteorological app field. It brings with it much power and a slightly odd user interface. Wx can help you decide if you should bring an umbrella to work with you, or it can tell you the current temperature readily either in the dock, in the main window of the app, or in a floating mini display. But Wx is for anyone who’s serious about the weather. You can track up to 20 locations by entering a zip code, city/state combination, Latitude/Longitude, or by clicking on a point on a Google map (neat way to get a specific location without knowing the Latitude/Longitude). A dizzying array of preferences awaits you in Wx. Best of all you can set WxAlerts per location, which trigger certain actions if there is a weather alert at that location. For example, if there is a hurricane watch declared in the area of your kid’s school, you can set up Wx to alert you with a text message, e-mail, or run an AppleScript. 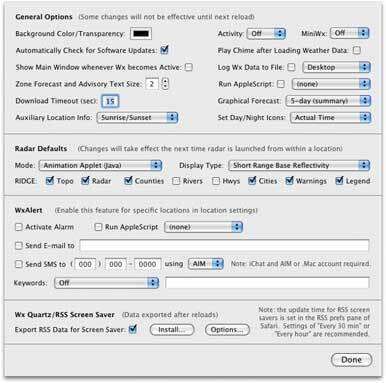 Wx also includes an optional screensaver that displays weather data based on an RSS file the application exports. Wx's power is only slightly hampered by its interface. For example, you can’t reorder the location list by dragging and dropping locations; you must click on Edit Location Settings and then move them using that dropdown screen. Also, Wx has a large number of preferences that you can set, but they are all displayed on the same screen, which is a little overwhelming. The Wx main window packs a lot of weather information into a small space. Our 186-page Mac Gems Superguide is a veritable greatest hits of Mac Gems. It's available as a PDF download, PDF on CD-ROM, or as a printed book. Learn more about the Mac Gems Superguide. Scott McNulty is the author of many technology books, a Kindle enthusiast, and all an around righteous dude.